This question was submitted last week, and also came up in my training class last week, so I thought I would address it! Dogs generally operate on a gorge and starve system. Their ancestors didn’t have their meals in 30b bags, so they would eat whatever is available then move on. To help alleviate the gorge eating, I would suggest turning your feeding time into a game or mind puzzle. You can do this by using a slow feeder, spreading the food out on a dinner tray or across the floor, tug a jug, Nina Ottoson puzzle, or hand feeding your pets daily ration while training. Another thing you can try is splitting the daily ration into several meals through out the day. If you have multiple pets at home I would suggest feeding each one in a different area. 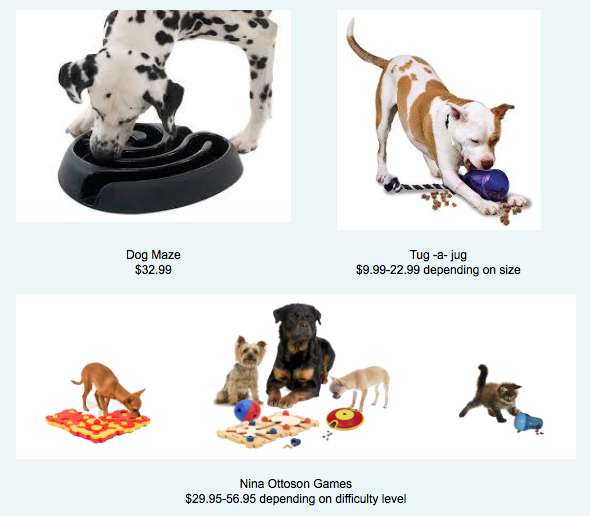 Below are just a few items dogs love and we have in store to better help alleviate gorge eating!